4 Bedroom Semi Detached House For Sale in Robertsbridge for £500,000. Delightful attached period cottage with character accommodation across two floors with a fully refurbished interior to include a lovely beamed, period principal reception and master bedroom. There are four bedrooms in total and a recently refitted kitchen to the rear aspect. A level, landscaped rear garden and a pretty lawned front garden. A fantastic Grade II listed property which we believe dates back to the mid eighteenth century with deceptively well proportioned and in our opinion well presented accommodation which has been extensively and sympathetically refurbished. 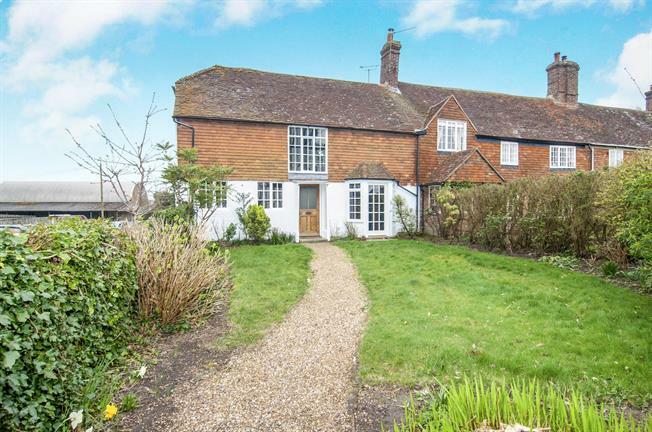 The property features characteristic features of the period to include an impressive full width back lit inglenook fireplace with bressumer beam over and wood burning stove on flagstone hearth. Many rooms are heavily beamed however still offer generous ceiling heights. A particular feature is the dramatic master bedroom which is double aspect and spectacular vaulted ceilings. The first floor accomodation features a delightful 28' double aspect drawing room with heavily timbered ceiling, full width inglenook fireplace with bressumer beam, wood burning stove on flagstone hearth, recessed lighting, bay window to front and multi-paned door to garden. An inner hall/study area is accessed from the drawing room, this is a useful area with window to the side elevations and under stairs recess. A cloakroom with shower cubicle and Triton shower system, pedestal basin, low level WC and window to side elevations of the property. A well presented kitchen/breakfast room is also offered and is fitted with an extensive range of oak base and eye level units with complimentary work surfaces over, space and plumbing for dishwasher and washing machine, fitted halogen hob with extractor over and integrated double oven. The breakfast area is found through a brick archway with further matching base and eye level units and work surfaces over, space for fridge freezer and window to side elevations. A galleried landing with further exposed timbers, flank window and access to the large roof void is found at the top of the stairs, a doorway leads through to the impressive master bedroom which offers genuine wow-factor with its heavy timbers and vaulted ceilings, double aspect and an excellent range of built in furniture. Bedroom two is also heavily timbered and also offers fitted double wardrobes. Bedrooms three and four also offer exposed timbers. A refitted contemporary family bathroom with matching suite comprising of bath with mixer tap over and hand held shower attachment, low level WC, wash hand basin, chrome heated towel rail and recently fitted slate tile flooring. This period cottage offers both front and rear gardens, to the front the gardens are predominantly laid to lawn with a shingle pathway, boundary hedging and a range of established shrubs and trees. The rear gardens offer seclusion and privacy with paved patio terrace which we consider ideal for al-fresco dining/entertaining with the remainder being laid to lawn and is enclosed with close boarded fencing. There is a decked area at the bottom of the cottage style gardens and a side gate which leads to the adjacent parking area. Situated in the heart of this picturesque and sought after village of Ewhurst Green, a timeless environment, set amidst various properties of significant architectural and historical interest and delightful church and country pub/restaurant. There are public and private schools within easy reach and the nearby village of Robertsbridge has a good selection of High Street shops and facilities and together with the market town of Battle offers a mainline rail link to London on the Charing Cross/Cannon Street line. In the general area there are many places of interest, sport and recreational facilities and numerous bridleways and footpaths forming part of the High Weald conservation area.